Strategies Games - Board Games Quiddler Set Enterprises, Inc.
Quiddler is a beautiful word game with naturally smooth game play that plays fast. These are essentials for a successful game that few word games have. Using special cards, Quiddler draws on one`s ability to combine letters into words. Players must combine their entire hand into words trying to use the highest point value letters. Quiddler challenges you to do this first with three cards (round one), then with four, on up to ten cards in the last round. A bonus is given for both, the longest word, and the most words made by a player in each round. The average game takes 20-40 minutes. Although it may appear that the person who knows the most words would consistently win, this is not the case when playing Quiddler. There is a visual perception aspect that draws on combining the cards with the highest points into the words rather than the first words a player recognizes. There is also an element of strategy. Players who win often, don`t go out at their first opportunity; on the other hand, sometimes they go out as soon as possible. Their actions are aimed at increasing their odds of getting either the longest word or the most words bonus. The game works well for both, beginning readers and accomplished word game players. 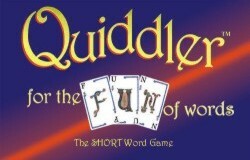 Youngsters can enjoy Quiddler because players can win using short words. This results from the bonus for getting the most words in any round, which, of course, is obtained using short words i.e., zoo, is, of. On the other hand, accomplished word lovers are challenged because of the bonus given for the longest word in any round, as well as the aspects noted above. The solitaire rules included with Quiddler result in endless hours of word challenges for the single player. Although each game is quick to play (about 15-20 minutes), people have tended to play game after game.